What All I Need To Write A Bio Data? Mandatory Ingredients: A sheet of paper or computer enabled with Office / Open Office Like software program; Copy of your passport size digital photograph, and you. Pick Your Photograph: Paste it in the top right zone of your bio data. 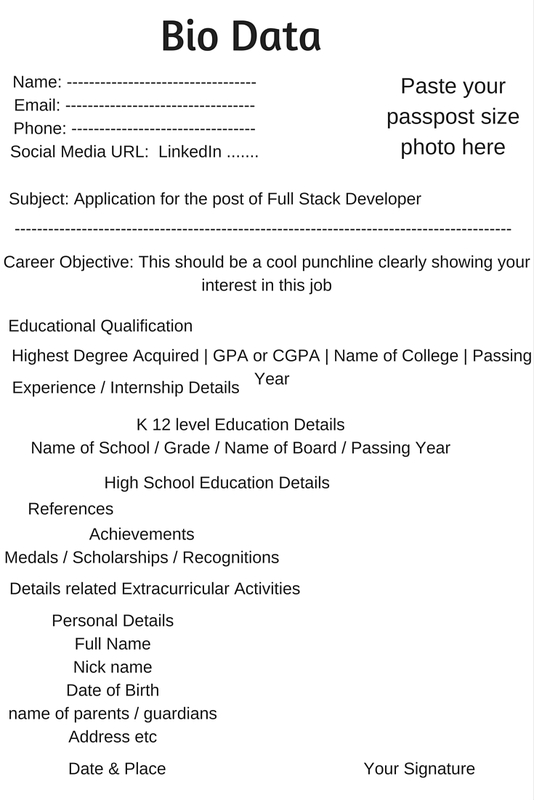 Career Objective: Whether this is most desirable job you are applying for or not, write a cool catchy heading that shows you are best fit for this job. DO NOT BEG. Tell your worth, why you are valuable to this employer in some 25/30 words. Educational Qualification: I prefer mention of educational qualification in descending order. Latest qualification acquired should get mention first then previous one. 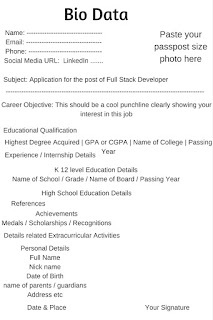 If you did internship during college years, mention it next to college level qualification, followed by other educational details. References Matters: At least 2 references are recommended. However, you can mention 2 / 3. References should not be coming from close sources like a relative etc. Your faculty / project guide or the place where you did internship or a employer, in case you did some work previously, are considered as better references. No, don't jump. Mention your special achievements during school and college years, for example, Scholarships Won, Medals and Other Recognition/ Honors and Awards. At the end, in the left zone write Date and Place and adjacent to this in the right zone, put your signature. Following shown Anatomy Of A College Fresher Bio Data in image you can download and print. Recruiters get thousands of resumes like your's for every single post advertised. Your resume need to stand out in the crowd. No recruiter has time to read each and every applicants' resume word to word. Your bio data passes through scanning eyes. Make your bio data presentable so recruiter does notice it and shortlist instead of sending into the trash can. Take special care for spacing between lines and paragraphs. Do not create unwanted empty white spaces between lines / words / characters. KISS (Keep It Short & Simple): If not ultimately necessary, create your bio data so that it limit within one A4 size of paper sheet. Proofread: Once you write complete details, must proofread it for spelling and grammar errors. Small mistakes may cost you dearly. Do you know a tip that can benefit college freshers while applying for job? Share here through comment box below. If you liked reading this article, please do a favor by pressing a social media button below.